The Coleraine Staff Community Choir have had a hugely enjoyable and successful first year, with a core membership of over 50 staff members who meet regularly to sing, perform and socialise together. As reported in Insight, when the choir first formed, the genre presently covered is popular music, with the specific theme for this year being ‘Through the Decades’, which has been chosen specifically to coincide with celebrating 50 years of Ulster at the Coleraine Campus, covering songs from the 1960’s to the present. 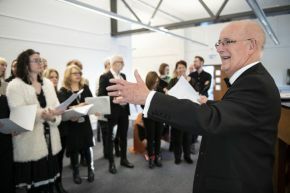 Professor Roger Austin conducts the choir, with assistance from a number of staff who volunteer their time to help organise the choir activities. "I love choral music and the chance to share my joy in singing with this lovely bunch of people. It is a fantastic journey to hear the early struggles, line by line, part by part, slowly coming together. Then, there is a moment of complete magic when the choir ‘gets it’ and all three parts blend and something quite beautiful emerges. It’s exhilarating, adrenaline-inducing and unlike anything I’ve experienced before." The choir has developed tremendously since its beginnings, and in its first year they have had the opportunity to perform at numerous events, on campus, and beyond in the heart of the community. Highlights for the choir include performing for HRH Prince Charles at the commencement of the 50th Year Campus Celebrations, at Coleraine campus ‘Welcome Week’, both the Provost and the Vice Chancellor’s Christmas Receptions and The PSNI Coral Service at St Patricks Church. The choir were also invited to perform as special guests at The Girona Community Orchestra’s annual Christmas performance at Flowerfield Arts Centre. “Aside from the great vibe and enjoyment we get from our rehearsals and performances, it is a joy to see the real impact that the choir is having on colleagues’ wellbeing. We regularly receive feedback from members who genuinely feel uplifted by the shared experience, and the sense of pride and community is tangible." "We couldn’t do any of this without the enthusiasm and dedication members have shown – they truly have helped to turn the dream held by the founding members, into a reality. Other key factors that have helped us to develop and grow have been the tireless work behind the scenes from core members of the choir committee, and the support shown by colleagues and the senior leadership team, notably our Provost, Professor Karise Hutchinson." Fundraising and giving back to the community is also a high priority for the choir. In their most recent fundraising event, they used their Christmas performance as an opportunity to raise funds for the Simon Community, one of Northern Ireland’s leading homeless charities. Students and staff were invited to watch the performance, and encouraged to sing-along with the choir to popular Christmas songs. The event was successful in bringing Christmas cheer to the campus while also raising much-needed funds for a charity close to many hearts, especially during the festive season. Looking ahead the choir would like to continue using their activities to fundraise, and are now planning their next public performance, which will take place on the evening of Friday the 24th of May at the Riverside Theatre. This event will showcase the singing talents of the choir and other guest performers, and will be open to family, friends, colleagues and the wider community to attend. Save the date! "As a committed supporter of enhancing the experience for both staff and students at Coleraine, it warms my heart to see our staff choir accomplishing so much since their formation little over a year ago. We are delighted to hear that a choir has now also been launched on the Jordanstown Campus. We wish them well and would love to see a collaboration between the campus choirs at some stage in the future”. The choir rehearse every Wednesday and Friday lunchtime at the newly refurbished 'Collab Lab'. This is a bright and spacious creative space which is the perfect location for the staff to come together and practice. In terms of performances, the choir often perform at internal events on campus, and external events in the community. If you have an event that you would like the choir to participate in, you can enquire by emailing the team on uuc_choir@ulster.ac.uk.